AirPods, the world’s most popular wireless headphones, are getting even better<br/>New AirPods Are Powered by the New H1 Chip and Feature 50 Percent More Talk Time, Hands-Free “Hey Siri” and the Option of a Wireless Charging Case<br/>Cupertino, California — Apple today announced new <a href="https://www.apple.com/airpods/" target="_blank">AirPods</a>, the second generation of the world’s most popular wireless headphones. AirPods revolutionized the wireless audio experience with a breakthrough design and the new AirPods build on the magical experience customers love. The new Apple-designed H1 chip, developed specifically for headphones, delivers performance efficiencies, faster connect times, more talk time and the convenience of hands-free &quot;Hey Siri.” AirPods come with either a standard charging case or a new Wireless Charging Case for convenient charging at home and on the go. 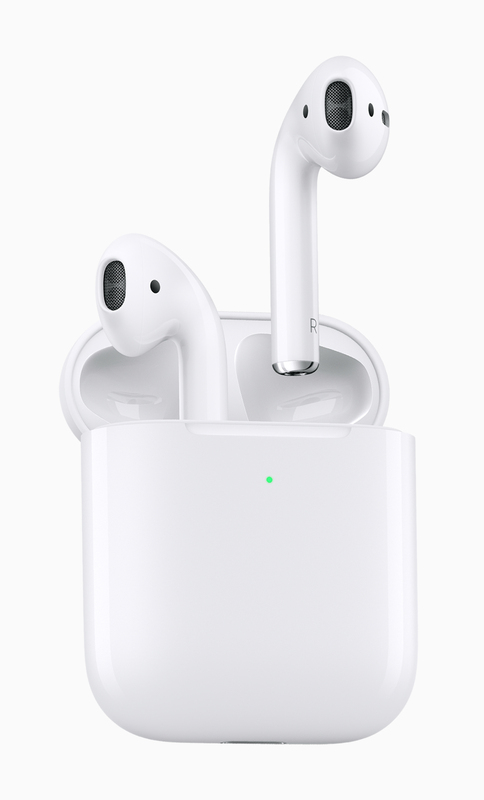 The new AirPods and AirPods with Wireless Charging Case are available to order on <a href="https://www.apple.com" target="_blank">apple.com</a> and the Apple Store app starting today, and in Apple Stores beginning next week.